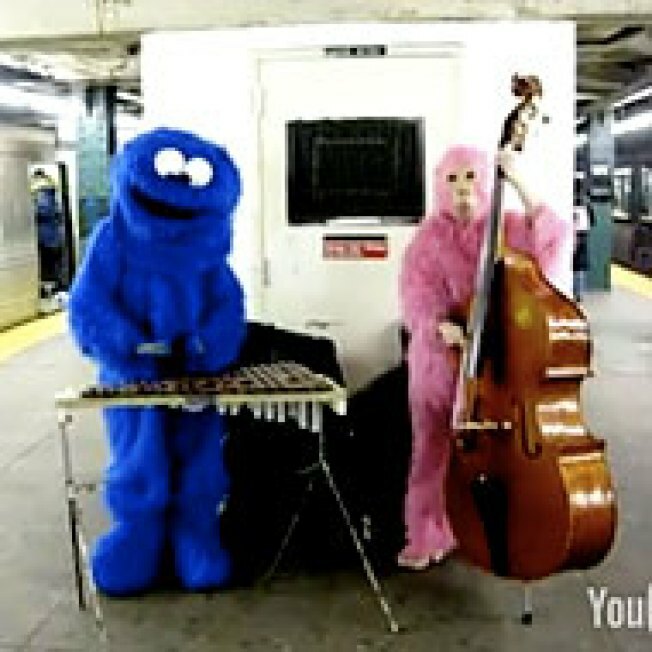 Because we weren't, and the knowledge that an illegal ragtime band that includes a pink gorilla on stand-up bass and a banjo-playing chicken is making the rounds on the New York subway system just kind of made our day. They are called the Xylopholks, and they are, apparently, overflowing with joy. "The main objective is to HAVE BIG FUN!" the band leader, Jon Singer, told Flavorpill. This would ordinarily be the sort of statement that annoys us, but at this particular moment in time we find we are able to let it slide. "The other day a woman was listening to us for a while, almost in tears because she was smiling so much," Singer said. "She told us she was just laid off and that this was exactly what New Yorkers needed." Also, dudes in giant furry suits are always funny.